Travertine paving can be tile or pavers. Travertine tile is usually thinner than pavers. A travertine tile installation is done by setting the stones in concrete. Stone pavers are dry laid. I like to use the pavers on my design projects. 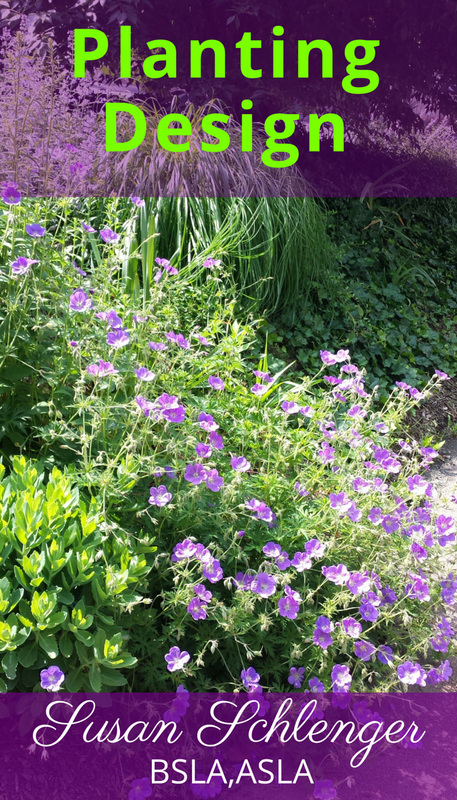 They are stunning, easy to install, cool to the touch, and resist freeze-thaw conditions. Travertine maintenance is easy. Sealing travertine tile or pavers is optional but sealers will protect from stains. 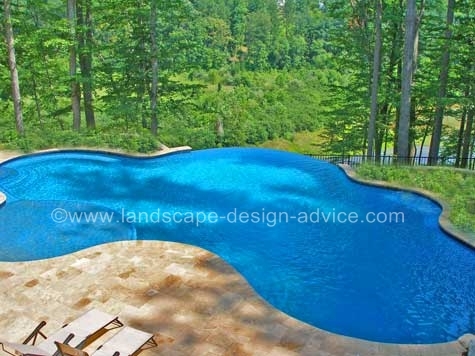 Some of the most beautiful pool projects I have designed included this type of natural stone for the pool paving. Travertine pavers come in many different colors and sizes. The french pattern is a popular one where there are four different sizes used to make the design. 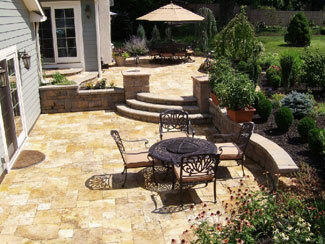 Here are some examples travertine patios and how this stone can be used. In this photo you can see how it's possible to be quite creative with travertine. 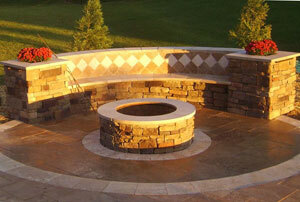 Circular borders were created with another color and emphasize the stone fire pit. Natural stone was used for the wall with matching travertine for the seat. I love the mix of the two colors together in the paving design. Project by others. If you'd like to read more about travertine, please visit my page types of travertine, where I discuss stone quality and the differences between honed, filled and tumbled travertine. Honed travertine is where the stones are "sanded" in layers to reduce the holes. Tumbled is another type of travertine if you want a rougher look. Non-tumbled pavers provide a smoother finish. There is also the quality of the stones themselves. Not all travertine is the same! Also, should you use a travertine sealer and what kind? There are various types to use...some are water based while others are oil based. For this two level patio, a golden color was used and is lovely. Block walls were used for the retaining walls and blend well with the travertine. 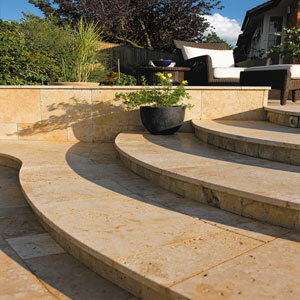 Another option would have been to use travertine on the steps as the treads and use either natural stone (as the photo above shows) or mortared smaller sized travertine tiles on the risers. In addition to the travertine, some nice features of this design are the curved steps and columns. The walls are seat wall height and provide additional seating. Above photos courtesy of MuirView Landscape & Design - Morgantown, Pa.
Travertine pavers were used here for the step treads, risers and walls. The wide, curvilinear steps are striking and probably match the paving above. Treads are of the same material. Whether you choose travertine stone tile or pavers, this is one of the loveliest paving materials available. It's a natural stone, cool on the feet and costs are in line with dry laid bluestone. 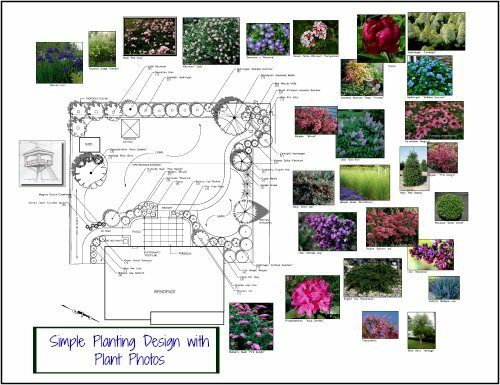 Take a look at my ebook on patio designs to get some great ideas for your pool paving such as seat walls, pergolas, shapes and sizes. Here you will find detailed information on what your project might cost. This is based on my experience with estimating and project management.